On a cold and overcast February morning, Vodafone McLaren Mercedes turned up for a spot of straight line testing at Kemble Airport in Gloucestershire. 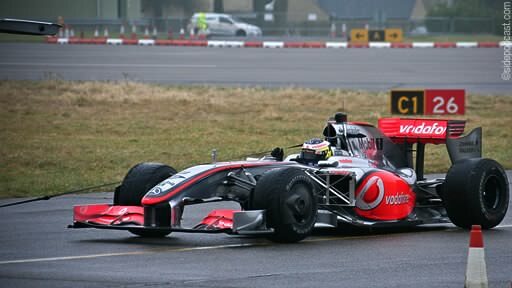 Pedro de la Rosa was at the wheel of the MP4-24 but managed just a couple of runs on a damp track before the car stalled whilst the man performed what appeared to be a practice start. Pedro was duly towed back to the awning. Of note, McLaren arrived on site yesterday with not one, but four transporters along with a fifth running Mobil 1 branding. 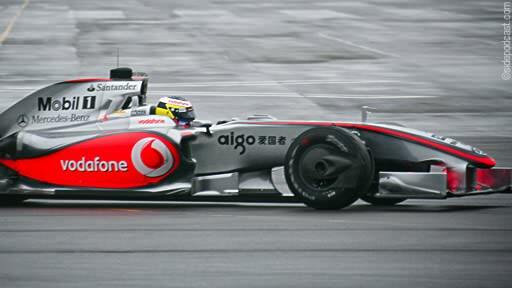 Sounds to me like we need to start a "McLaren have '09 aero problems" rumour. Maybe the test crew hadn't wound the car up to its maximum, or maybe they were testing something different, but I found the Mercedes engine to be notably quieter than the Renault during a previous test. Aside from the decidedly odd rear wing, which isn't attractive from any angle, the 2009 McLaren was lovely to see up close, although it did look better when running under its own steam. 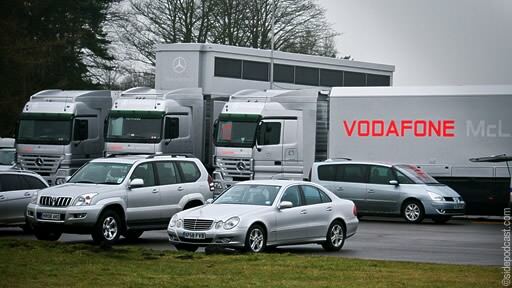 We also have to say a big thank you to Graham who let us know the Vodafone transporters had arrived. Very much appreciated. Previous post Virgin Group bidding for Honda F1?